TGIF. Is It Monday Yet? It’s Friday, and that means only one more weekend until the championship game. I don’t know about you, but I’m freaking out a little bit, in a good way of course. 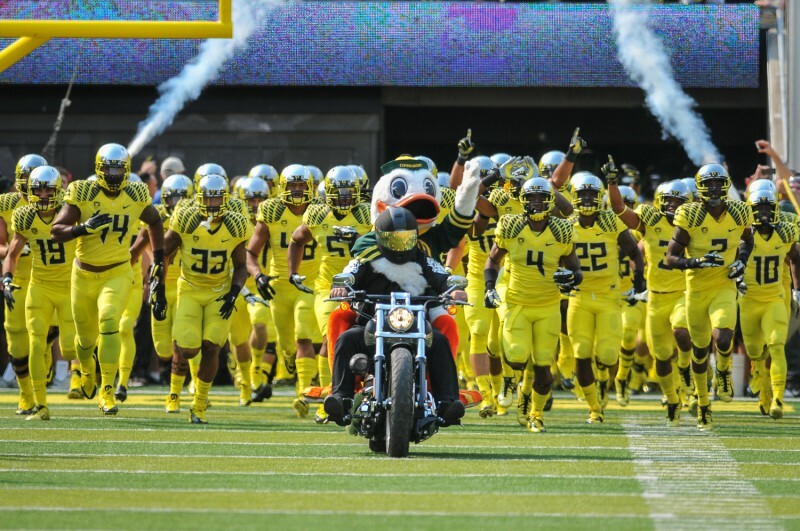 Oregon has a chance to be crowned the best team in college football for the first time ever. I don’t have to tell you that this is a big deal. The 2010 season feels like forever ago now. It was my first year as a student at the University of Oregon, and growing up in Eugene, I knew how special a national title would be to the town, the school and everyone who cheers for the green and yellow. But the Ducks lost 22-19 in one of the best championship games of late. It wasn’t the perfect ending to the only perfect regular season Oregon has ever seen, but it did show the nation that we belong with the elite. That was the beginning of the excellence we see today. In fact, following the 2010 season, the Ducks were one late loss away from going to the title game again for the previous three seasons. A loss to USC, and two losses to Stanford, derailed Oregon’s return to the title game; but wins in the Rose, Fiesta and Alamo bowls are a nice consolation prize. Still, the Ducks and their fans wanted more. Royce Freeman burst onto the scene with 13 carries for 89 yards and 2 TDs against MSU. After being so close for almost four straight years, 2014 was yet another chance for the Ducks to get to the college football peak. We had our leader back for his last hurrah and unfinished business remained. The big games were at home and the Ducks had the talent to make a run. However, a few preseason injuries, and the uncertainty of coach Mark Helfrich’s ability to lead the team, had some fans skeptical as the season kicked off. But the Ducks, and Helfrich, regained those fans’ confidence by beating Michigan State 46-27 in week two, but it hasn’t been all smooth sailing from there. I went to the Washington State game up in Pullman and knew the offensive line was banged up headed into the game. But even I didn’t expect that in the 38-31 win Marcus Mariota would be sacked seven times. Our line looked horrible, and the Arizona rematch was only two weeks away. Perfection wasn’t in the cards for the Ducks this year. Oregon fell to Arizona 31-24, and the chance to play in the National Championship seemed lost, but that was on October 2nd and there was a lot of football yet to be played. The Ducks proved they could beat physical teams once again. Not this year Stanford. Then it happened: Jake Fisher came back and the offensive line came together; the wins returned. Three straight victories later, and it was Stanford time again. Could the Ducks beat the team that ended their title hopes the last two years? Could Mariota get over his Stanford hump? Were these Ducks legit title contenders? Yes. It was that simple. Oregon dominated the Cardinal 45-16, and fans started to believe again. The Ducks were 8-1 and headed into the final stretch of the season. It was time to put up or shut up. Marcus Mariota became the greatest Oregon Duck ever in 2014. Racking up the awards and leading the Ducks to the national title. Oregon cruised to wins over Utah (helped by that crazy dropped touchdown turned fumble return for touchdown), Colorado and Oregon State to close out the regular season at 11-1 and in perfect position to get one of the four prized college football playoff spots. On December 5th, the Ducks won their first Pac-12 title since 2011, dominating Arizona 51-13 in the rematch. A week later the greatness of Mariota was recognized and Oregon had its first ever Heisman Trophy winner – October 2nd felt like it never even happened. The Ducks earned a playoff spot, and would face the undefeated Florida State Seminoles in the Rose Bowl. Being in the final four was historic enough, but the Ducks had to win, they just had to. And win they did. The complete annihilation of FSU proved to the nation what us fans knew all along, that this team was special. And now when I see the number 59, I smile inside. January 12th is only three days away. This is real, and I can’t remember the last time I wanted a weekend to end so quickly. Our Oregon Ducks have once again climbed to the top of the college football peak, and it’s now time to leave it all out on the field. Enjoy the weekend, but is it Monday yet?